Basic sparring (kihon kumite) was first introduced into karate in the 1920s by Gichin Funakoshi. It was made possible by the contact of karate with the ethics of Japanese martial arts, which stress mutual trust between opponents. Gradually, basic sparring was developed until free style sparring and finally contest became possible. The modern student, in his own personal development, follows the same path from five- and one-step basic sparring to competition. All forms of sparring begin and end with a standing bow to one's partner. Kihon-kumite (basic sparring). In this kind of sparring, the attack and the target are both predetermined, the participants facing each other from a fixed distance and taking turns to attack and defend. Commonly, beginners will practise both one-step and five-step basic sparring. To begin either kind, the attacker steps back into zenkutsu-dachi (gedan-barai) while the defender waits in hachiji-dachi. 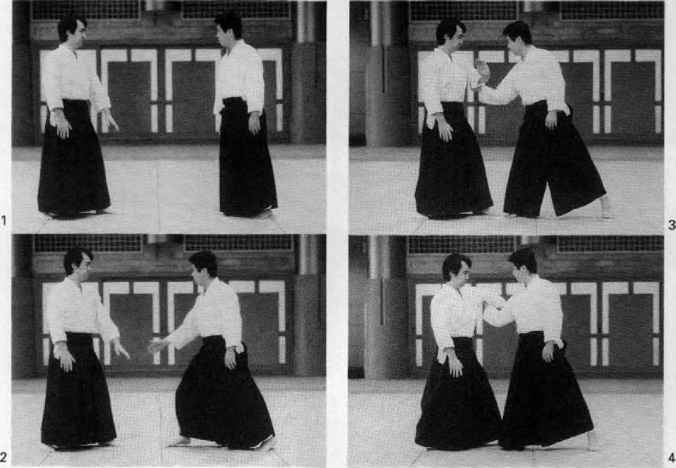 In five-step sparring, the attacker announces whether the attacks are to be to the face (jodan) or stomach (chudan) and then takes five steps forward, attacking with each step. His partner takes five steps backward, parrying each attack and countering with a 'kiai' after the fifth and final attack. One-step sparring is similar, but only one attack is made which is immediately parried and countered by the defender, also with a 'kiai'. After the final counter, in both the one-step and five-step forms, the participants are 'frozen' for a few moments with the fists extended. Jiyu-ippon kumite (free one-step sparring) is the next step towards free-sparring. Both the attack and the defense are again pre-determined, but this time each participant assumes a ready position and moves around, the attacker looking for an opening and making the correct distance preparatory to his attack. The defender must be ready for the attack at every moment. A variation of the free one-step sparring which is even closer to the free-style proper is to predetermine only who should attack and who defend. Again, however, only one attack should be used. In free one-step sparring the participants do not 'freeze' after the counter but immediately resume ready positions. Note that it is very important to practise all the forms of basic sparring with full spirit. As the attack is predetermined, the defender should be able to cope with it. Therefore, the attacker should try his hardest to 'get through'. The counter-attack, on the other hand, must never make contact, because the first attacker must make no attempt to resist it. He offers himself as a target. Jiyu-kumite (free-style sparring). This is the most advanced form of sparring. Beginners are not encouraged to practise it, not so much because it is dangerous because beginners haven't really the power or the technique to attack dangerously, but because it can impede the development of power and technique. 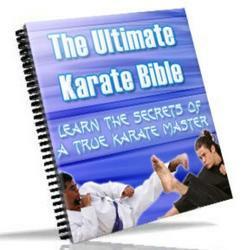 Faced with an opponent, the beginner will forget all the basic training he has so far learned. At a later stage, however, it is the most realistic application possible of the skill he has acquired. Of course, at this stage there would be danger of serious injury if a vital point were struck with a focused attack. But the ability to focus even powerful techniques a fraction of an inch short of contact is one of the measures of proficiency in karate. The rules forbid any actual contact being made by an attack, and also any such auxiliary action as stamping the instep strongly enough to cause injury. In spite of these precautions, free sparring does have elements of genuine competition and is gaining wide popularity as a spectator sport in Japan and elsewhere. Enormous suspense is created by the 'battle of minds' that typically precede a physical attack, and this latter is so swift, and the technique that wins the point so convincing, that the imagination is easily satisfied as to what the outcome might have been were the rules less civilized.